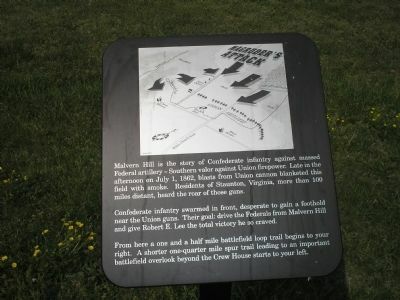 Malvern Hill is the story of Confederate infantry against massed Federal artillery – Southern valor against Union firepower. Late in the afternoon of July 1, 1862, blasts from Union cannon blanketed this field with smoke. Residents of Staunton, Virginia, more than 100 miles distant, heard the roar of those guns. Confederate infantry swarmed in front, desperate to gain a foothold near the Union guns. Their goal: drive the Federals from Malvern Hill and give Robert E. Lee the total victory he so craved. From here a one and a half mile battlefield loop trail begins to your right. A shorter one-quarter mile spur trail leading to an important battlefield overlook beyond the Crew House starts to your left. Erected by Richmond National Battlefield Park – National Park Service. 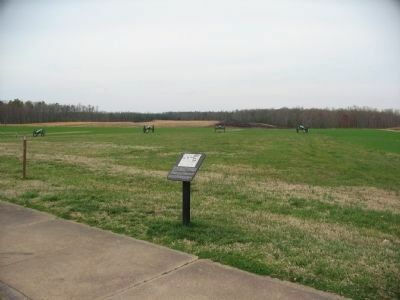 Battlefield Unit of Richmond National Battlefield Park. Marker is in this post office area: Henrico VA 23231, United States of America. Touch for directions. Other nearby markers. At least 8 other markers are within walking distance of this marker. Southern Valor vs. Union Firepower (here, next to this marker); a different marker also named Malvern Hill (a few steps from this marker); A Splendid Field of Battle (within shouting distance of this marker); Battlefield of Malvern Hill (within shouting distance of this marker); Union Firepower (within shouting distance of this marker); Battlefield Landscape (within shouting distance of this marker); Seven Days Battles (about 300 feet away, measured in a direct line); The West House (about 300 feet away). Touch for a list and map of all markers in Glendale. More about this marker. 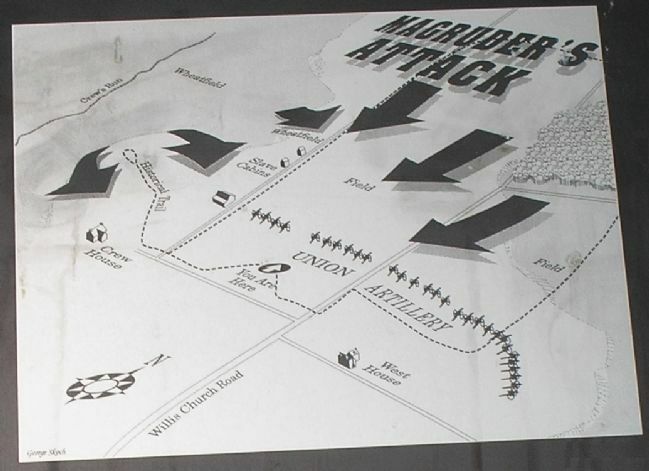 The top of the marker contains a battle map displaying Magruder's attack of the Union artillery placed in front of the marker. The location of the marker is also indicated. 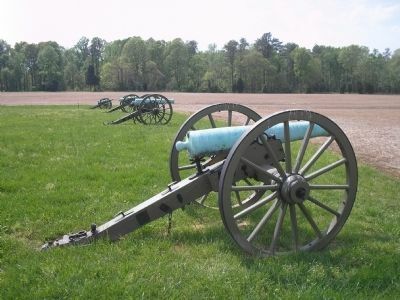 A stand of cannons are located in front of the marker, at the crest of Malvern Hill. Credits. This page was last revised on June 16, 2016. This page originally submitted on January 11, 2009, by Bill Coughlin of North Arlington, New Jersey. This page has been viewed 1,228 times since then and 7 times this year. Photos: 1. submitted on January 11, 2009, by Bill Coughlin of North Arlington, New Jersey. 2, 3. submitted on March 28, 2010, by Craig Swain of Leesburg, Virginia. 4, 5. submitted on January 11, 2009, by Bill Coughlin of North Arlington, New Jersey.